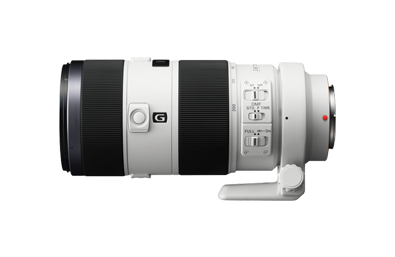 The Sony 70-200mm f/2.8 G SSM II Lens is a versatile zoom lens covering portrait-length to telephoto perspectives and featuring a constant f/2.8 maximum aperture for enhanced low-light shooting and focus control throughout the zoom range. A Super Sonic Wave Motor (SSM) focusing mechanism provides fast, smooth, and quiet focusing performance with enhanced tracking capabilities that are well-suited to photographing quickly moving subjects. Also helping to increase focusing speeds is the integration of a Focus Range Limiter, which enables you to set pre-defined limits for the lens to focus within for faster response times. Additionally, when paired with Sony A-mount cameras, in-body image stabilization renders this lens stabilized and supports the use of longer shutter speeds with a reduction in appearance of camera shake. The optical design employs two extra-low dispersion elements to minimize chromatic aberrations throughout the zoom range as well as heighten image clarity and overall sharpness. A Nano AR (anti-reflective) coating has also been applied to lens elements in order to reduce lens flare and ghosting for more contrast-rich imagery and high color neutrality. Portrait-length to telephoto zoom lens featuring a constant f/2.8 maximum aperture for consistent low-light performance and focusing control throughout the zoom range. Super Sonic wave Motor (SSM) provides fast, smooth, and quiet focusing performance with enhanced subject-tracking capabilities. Focus Range Limiter enables you to preset a defined focusing range for faster, more controlled focusing. Two extra-low dispersion elements help to minimize chromatic aberrations and improve image quality and sharpness throughout the zoom range. Nano AR coating reduces lens flare and ghosting for higher clarity, contrast, and color fidelity. Nine-blade circular diaphragm produces a smooth out-of-focus quality that is well-suited to selective focus imagery. Compatible with optional 1.4x and 2.0x teleconverters for extending the reach of the lens even further.